Lighting designers are constantly pushing the envelope with new materials, technologies and applications – and this year’s London Design Festival was awash in innovative designs. From an air-purifying algae chandelier to a lamp powered by melting ice and a series of pendant lights made from mushrooms, read on for our favorite finds from this year’s shows. When is a chandelier more than just a chandelier? When it’s literally alive! 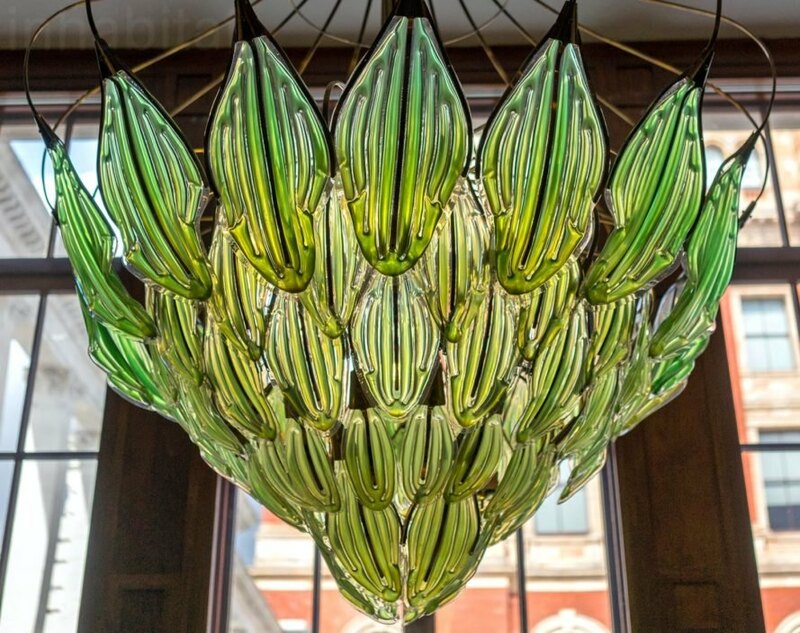 Julian Melchiorri‘s ‘Exhale’ chandelier is filled with algae that absorb CO2 and release fresh oxygen into any interior space. It’s also incredibly beautiful, with delicate green ‘leaves’ that optimize sun exposure to help the algae grow. 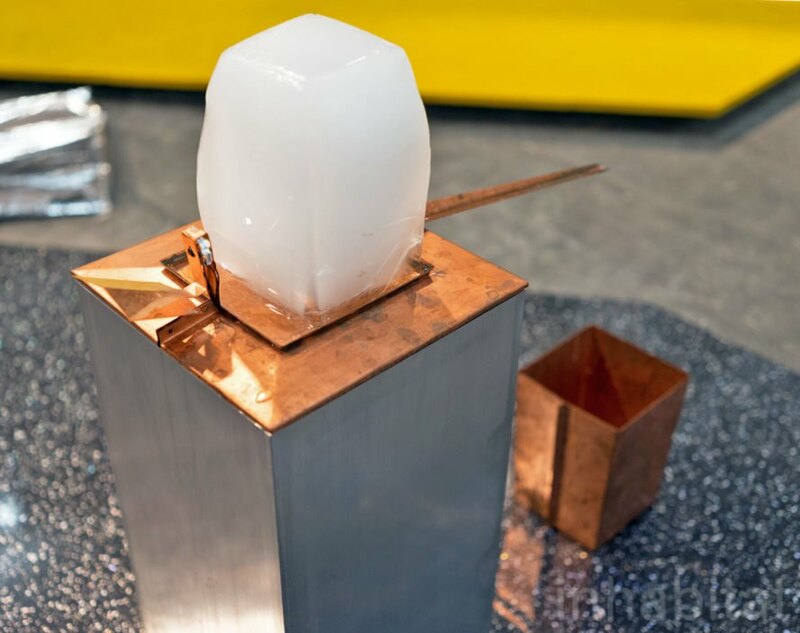 EDHV Studio’s Frost Light is powered by melting ice! A chunk of ice is set on a block of solid aluminum, and as it melts it generates enough electricity to power a small LED for 3 hours. Flynn Talbot’s Reflection Room is mind blowing. 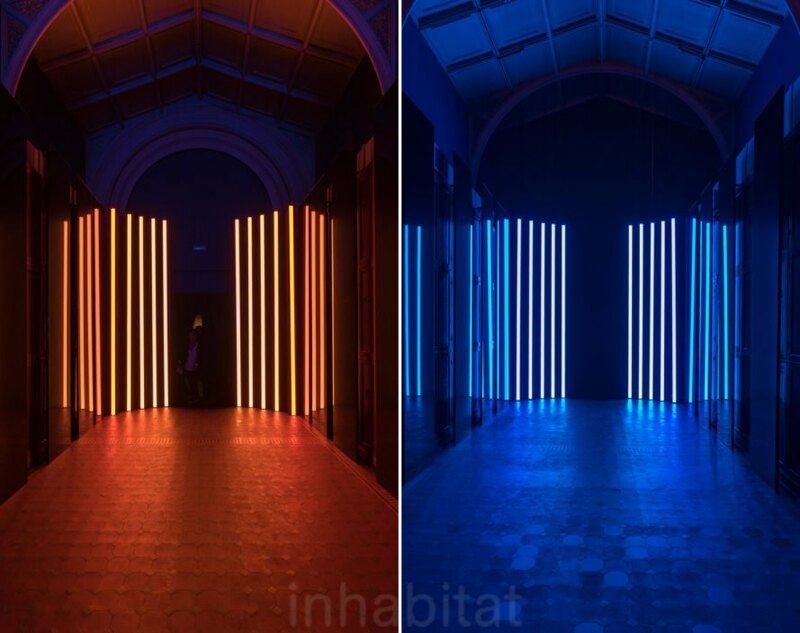 One side of the mirrored hallway is bathed in orange light, while the other is lit in blue. Where the two sides meet, a gradient of color is born. 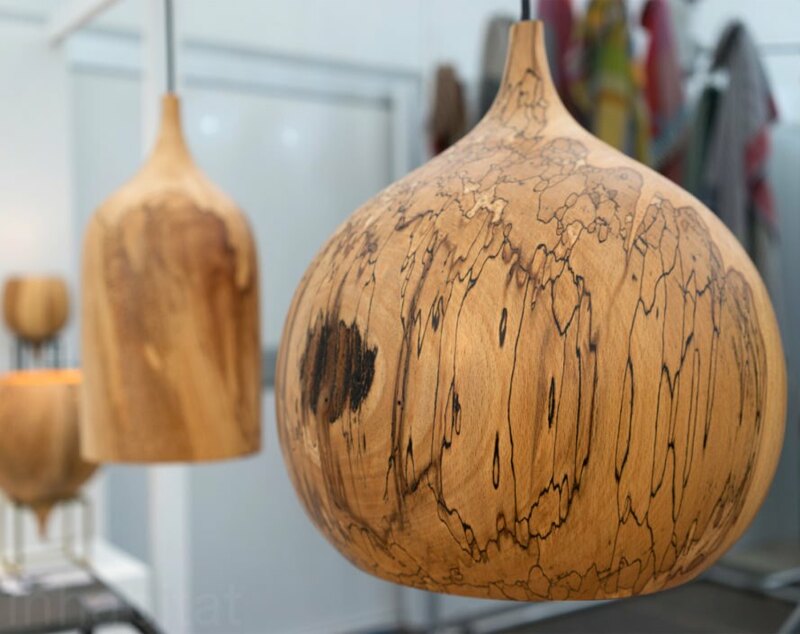 Macmaster Design‘s new Fuchsia lamps look like hanging, flowers in bloom – and they’re made from FSC-certified black walnut and white oak. Tala just launched their largest sculptural light yet at the London Design Festival. The Voronoi III is inspired by patterns found in treetops, and its LED filament is modeled after the Fibonacci sequence. 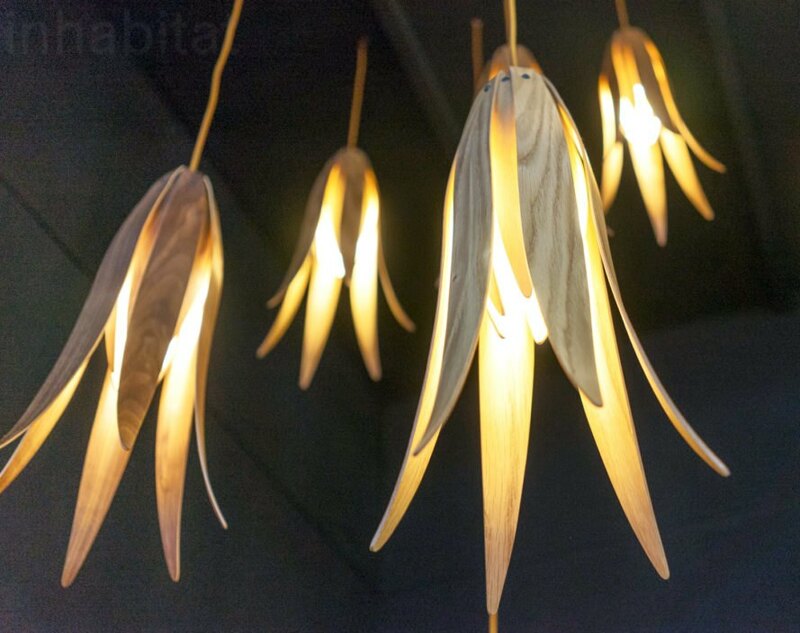 Tamasine Osher‘s gorgeous hand-turned Tree Lights are made of salvaged wood harvested from naturally fallen trees. The delicate patterns are caused by naturally occurring fungus that develops over a span of 2-3 years. 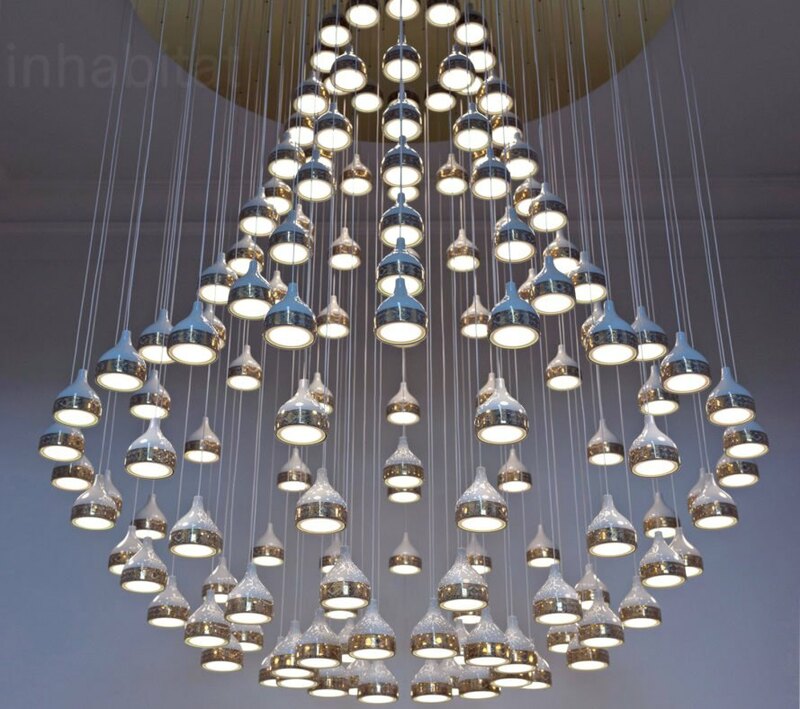 Blackbody teamed up with Haviland to unveil a spectacular chandelier made from 145 OLED lights. Each light is nested within a porcelain cup embellished with “Matignon” white with gold patterns. 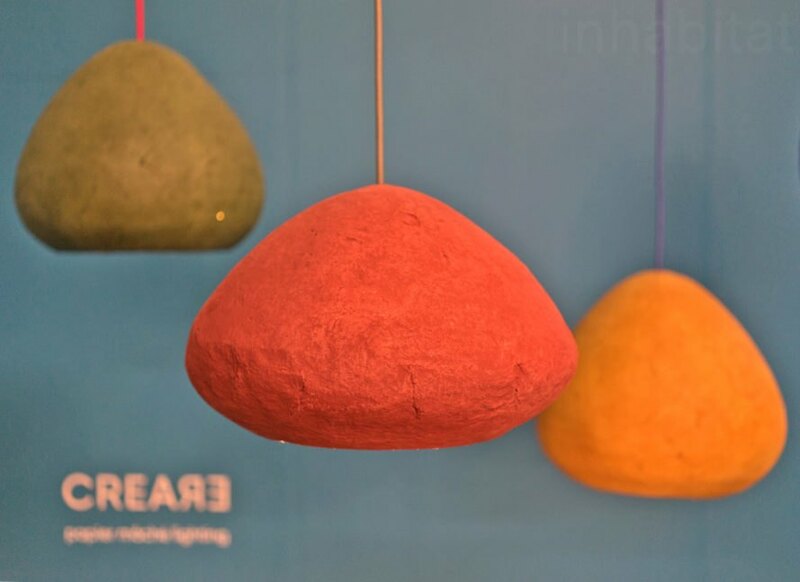 These beautiful lamps by Crea-Re look almost like colored stone – but they’re made from paper mâché! 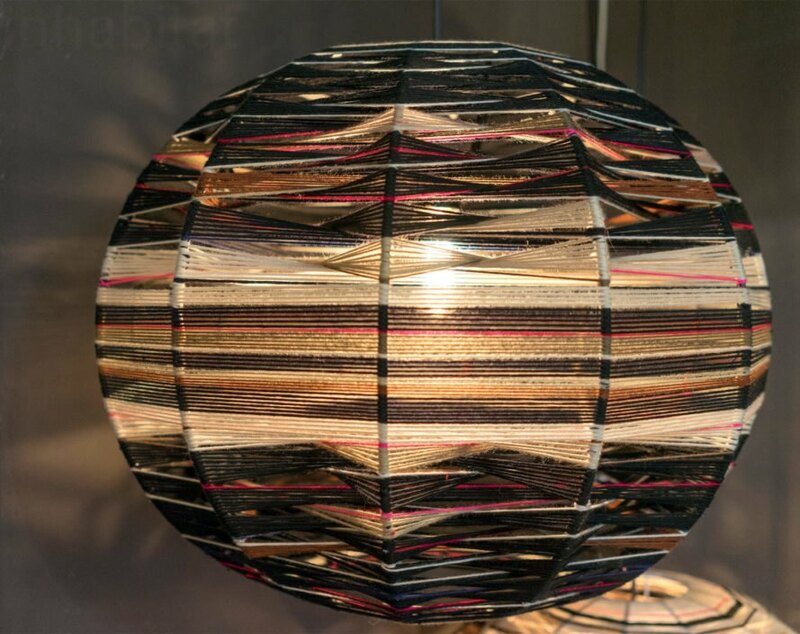 Maria Fiter crafts each lamp using recycled newspaper, natural pigments, and ecologically certified water-based glue. Tim van Cromvoirt‘s luminous Lungplant slowly expands and exhales like a living creature. He designed the lamp to reduce stress and create a meditative environment that encourages you to become aware of the tempo of your own breathing. These Thea Kuta lamps emerged out of Elisa Bortolussi’s desire to use yarn as an alternative tool for painting. The lamps are handmade from 100% wool, and their precise geometry and depth of color is dazzling. 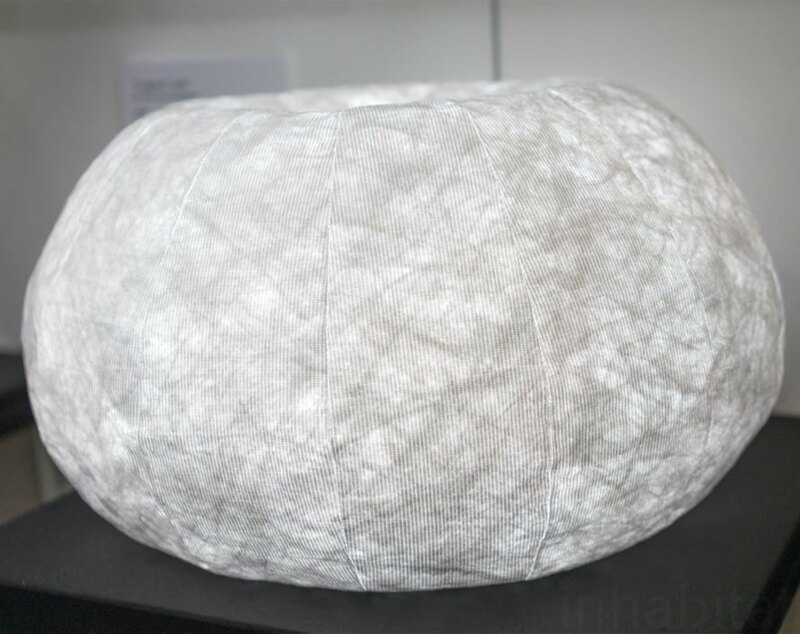 These lamps are made of mushrooms! Sebastian Cox and Ninela Ivanova found a way to pair mushroom mycelium with freshly cut wood waste to create a collection of sustainable furnishings. 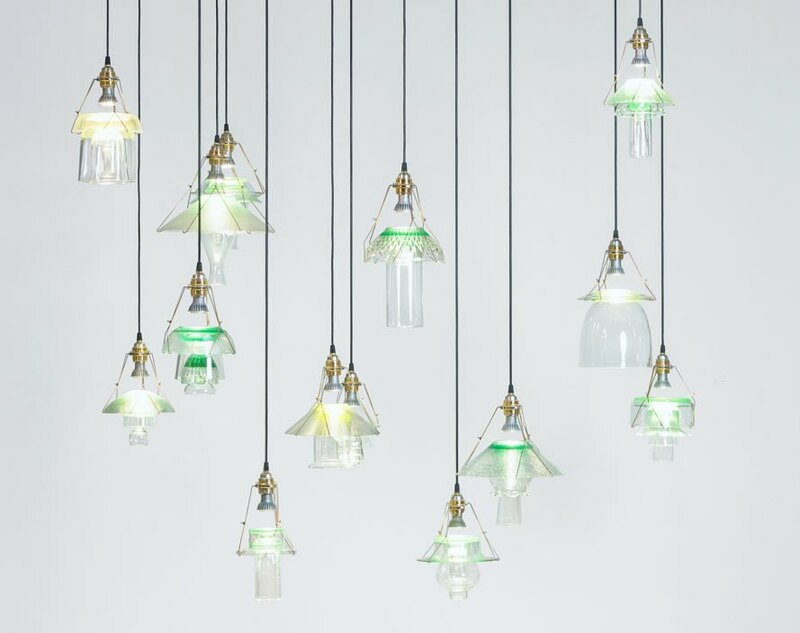 These beautiful pendant lights from New Citizen Design appear to be sculpted from glass – until a closer look reveals that they’re made of cups, bowls and plates! Designers Mayan Pesach and Sander Wassink salvage old glassware and combine it in unexpected ways – and each piece is unique. 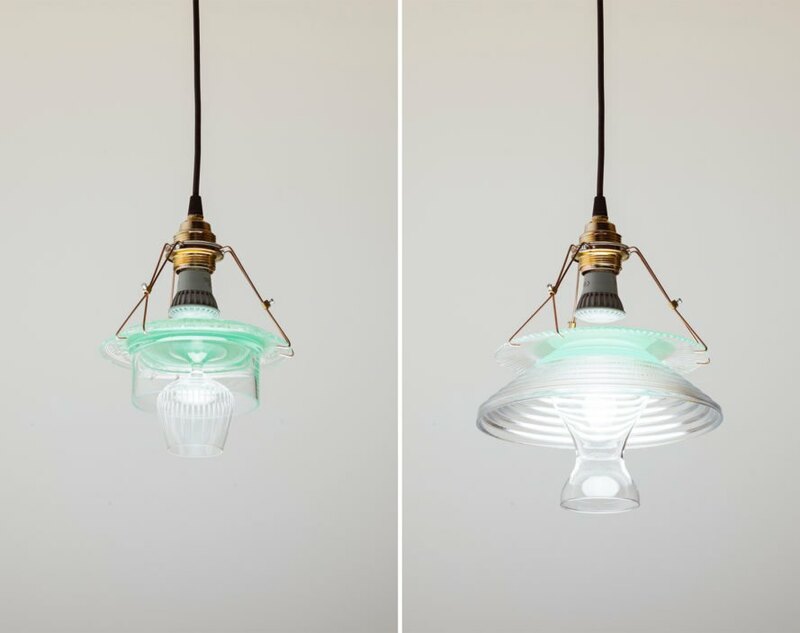 Lea Baert’s Panam Panama project transforms old fan grills into stunning lamps. Baert worked with communities of Panamanian craftspeople to develop the design using locally-sourced fibers. Upon returning to France, she updated the project with materials sourced locally in Paris. Ladies & Gentlemen teamed up with Seattle-based artist and glass designer John Hogan to create the Atlas Light. This handcrafted lamp consists of an iridescent glass sphere flecked with gold leaf and set on a brass base. Exhale Chandelier by Julian Melchiorri When is a chandelier more than just a chandelier? When it's literally alive! Julian Melchiorri's 'Exhale' chandelier is filled with algae that absorb CO2 and release fresh oxygen into any interior space. It's also incredibly beautiful, with delicate green 'leaves' that optimize sun exposure to help the algae grow. 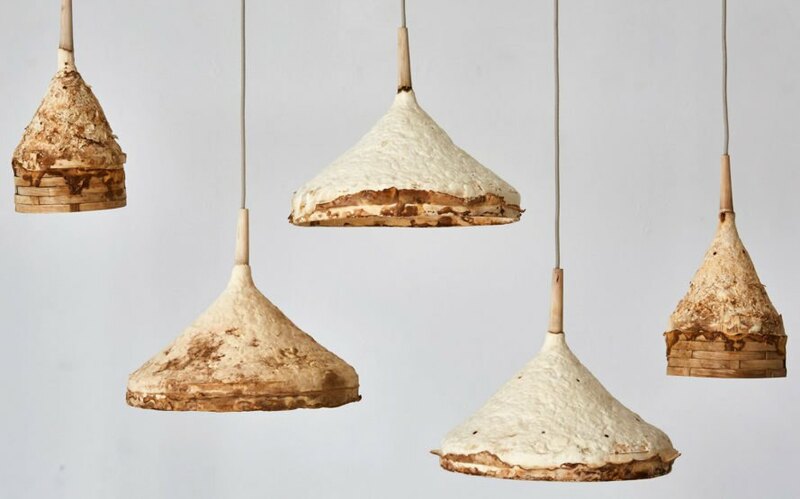 Mycelium + Timber Lamps by Sebastian Cox and Ninela Ivanova These lamps are made of mushrooms! Sebastian Cox and Ninela Ivanova found a way to pair mushroom mycelium with freshly cut wood waste to create a collection of sustainable furnishings. Frost Light by EDHV Studio EDHV Studio's Frost Light is powered by melting ice! A chunk of ice is set on a block of solid aluminum, and as it melts it generates enough electricity to power a small LED for 3 hours. Reflection Room by Flynn Talbot Flynn Talbot's Reflection Room is mind blowing. One side of the mirrored hallway is bathed in orange light, while the other is awash in blue. Where the two sides meet, a gradient of color is born. I.Rain Helene Chandelier by Blackbody and Haviland Blackbody teamed up with Haviland to unveil a spectacular chandelier made from 145 OLED lights. Each light is nested within a porcelain cup embellished with "Matignon" white with gold patterns. Tree Lights by Tamasine Osher Tamasine Osher's gorgeous hand-turned Tree Lights are made of salvaged wood harvested from naturally fallen trees. The delicate patterns are caused by naturally occurring fungus that develops over a span of 2-3 years. Fuchsia Lamps by Macmaster Design Macmaster Design's new Fuchsia lamps look like hanging, flowers in bloom - and they're made from FSC-certified black walnut and white oak. Morphe Lamp by Crea-Re These beautiful lamps by Crea-Re look almost like colored stone - but they're made from paper mâché! Maria Fiter crafts each lamp using recycled newspaper, natural pigments, and ecologically certified water-based glue. Stacked Glassware Lamps by New Citizen Design These beautiful pendant lights from New Citizen Design appear to be sculpted from glass - until a closer look reveals that they're made of cups, bowls and plates! Designers Mayan Pesach and Sander Wassink salvage old glassware and combine it in unexpected ways - and each piece is unique. Thea Kuta Lamp by Elisa Bortolussi These Thea Kuta lamps emerged out of Elisa Bortolussi's desire to use yarn as an alternative tool for painting. The lamps are handmade from 100% wool, and their precise geometry and depth of color is dazzling. Lungplant by Tim van Cromvoirt Tim van Cromvoirt's luminous Lungplant slowly expands and exhales like a living creature. He designed the lamp to reduce stress and create a meditative environment that encourages you to become aware of the tempo of your own breathing. Voronoi III Lamp by Tala Tala just launched their largest sculptural light yet at the London Design Festival. The Voronoi III is inspired by patterns found in treetops, and its LED filament is modeled after the Fibonacci sequence. 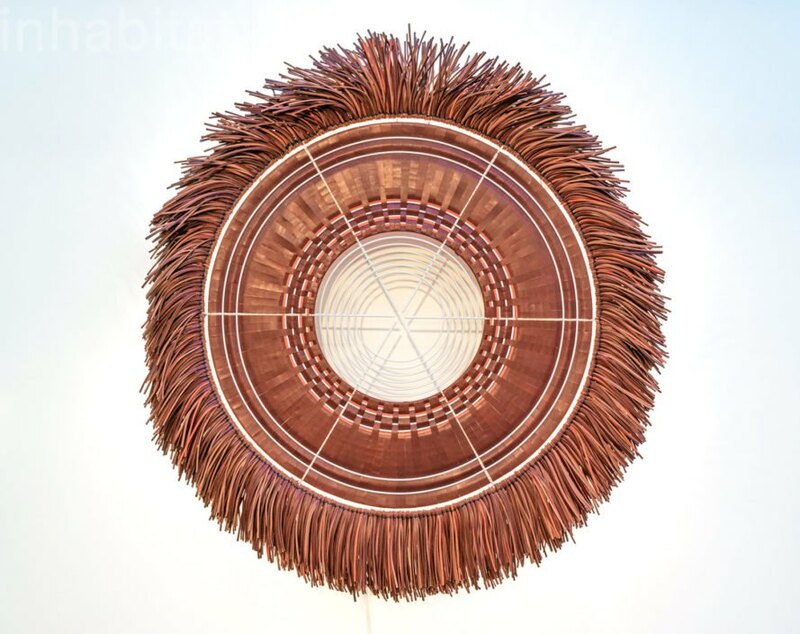 Panam Panama lamp by Lea Baert Lea Baert's Panam Panama project transforms old fan grills into stunning lamps. Baert worked with communities of Panamanian craftspeople to develop the design using locally-sourced fibers. Upon returning to France, she updated the project with materials sourced locally in Paris. Atlas Light by Ladies & Gentlemen Studio Ladies & Gentlemen teamed up with Seattle-based artist and glass designer John Hogan to create the Atlas Light. 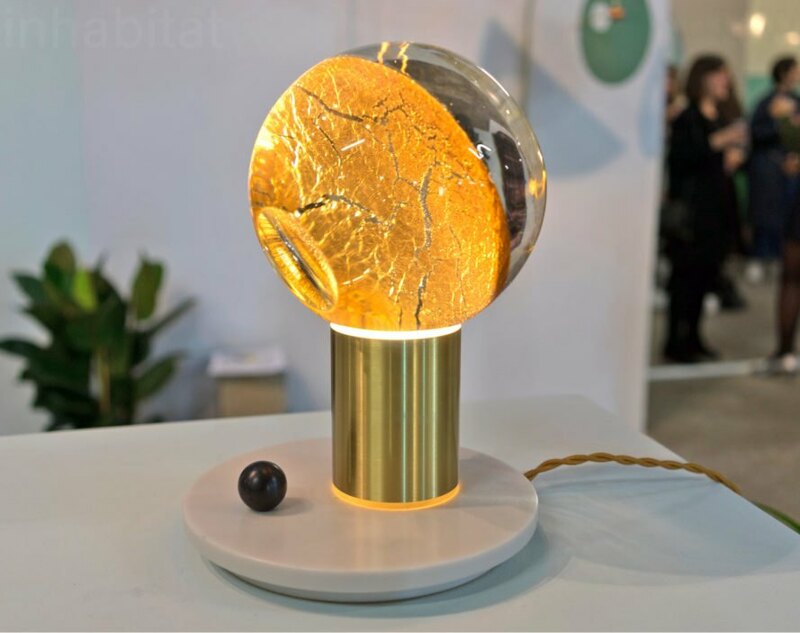 This handcrafted lamp consists of an iridescent glass sphere flecked with gold leaf and set on a brass base. 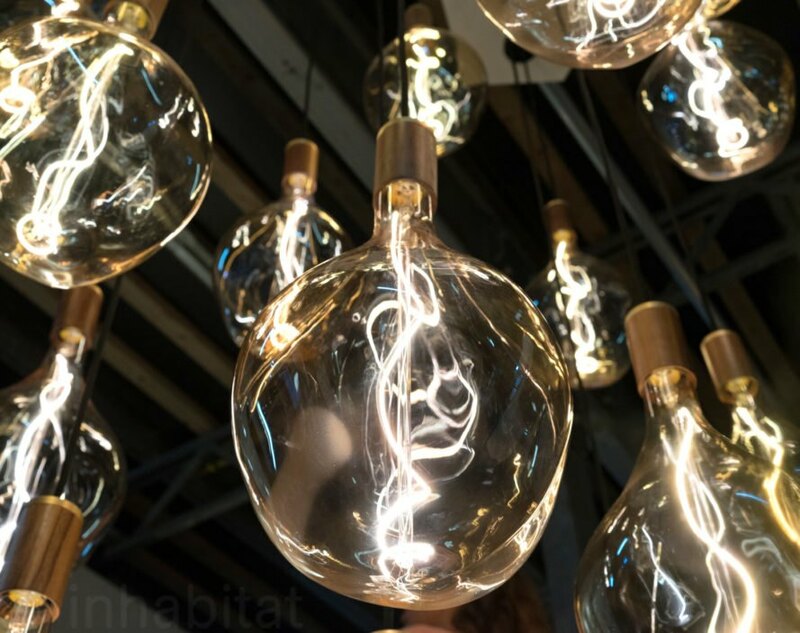 Lighting designers are constantly pushing the envelope with new materials, technologies and applications - and this year's London Design Festival was awash in innovative designs. From an air-purifying algae chandelier to a lamp powered by melting ice and a series of pendant lights made from mushrooms, read on for our favorite finds from this year's shows.